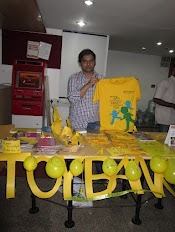 Toybanker - Omkar, helped us set up a stall and manned the stall all day long on the 14th of August, 2012 at the MPS office premises at Bangalore. An avenue for multiplying know-how provided by the connoisseurs’ of corporate social responsibility to the evangelists of The Right to Play - is just modest verbatim to summarize the chance to impart ways of contributing to leave a mark in the life of an unknown lesser-privileged child. Toybank is thankful to MPS Limited for being a harbinger of opportunity in allowing us to create awareness about the various initiatives of Toybank and showcase the unique catchy products on offer during a six hour window from 11:00 AM to 05:00 PM on 14-August-2012 as part of early Independence Day Celebration at Residency Road office of MPS Bangalore. 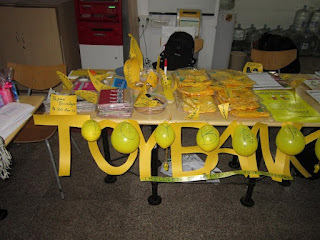 The plethora of goodies ranging from key chains , magnets, badges, multi-sized greeting cards, bookmarks ,paper-envelopes and the bubbly bright munsell yellow Toyank T-Shirts were laid carefully drawing analogies with sumptuous lavish royal spread. Each item description and pricing was displayed on differently shaped pieces of yellow cardboards. There was also ‘About Us’ section having basic literature about Toybank and a feedback book. The table space was well fenced by the bright alphabets comprising TOYBANK with a yellow line of billowing balloons complimented with a footer about entry into Children Zone. Toybank volunteers engaged in conversation with the visiting strolling MPS employees and briefed about the model of working of Toybank. MPS employees were also told of Toybank history, the purpose of having every kid the privilege to play with Toys at young age rather than being deprived of this opportunity, the equal stress on the motto of ‘The Right to Play’. People were also told of ways of contributing – in terms of toy donors, time as a volunteer. 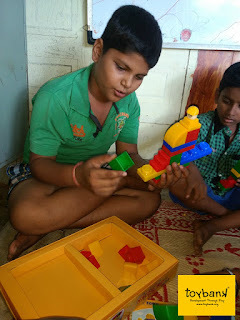 Toybank initiatives in and around Bangalore were made known – including tie ups with corporate for corporate collection and distributions, past activities and nature of activities. People were more interested in donating toys and some showed interest in volunteering or to recommend Toybank to someone else as a different clean NGO to volunteer for. People showed sufficient response and lend a patient ear to hear about us and our purpose coupled with significant outlay on Toybank memorabilia. 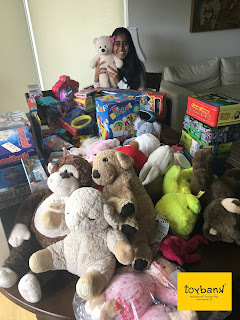 We would like to thank Shikha Gupta, old friend of Toybank from MPS for her time and efforts to liaison with both organizations to make this event symbiotically successful. Let us rest with hope that a latent smile of child bearing vagaries of class war gets converted into blooming smile lighting up their eyes and future.